After my post of two weeks ago, when I made scones for the first time, you probably guessed what I’d be posting this week. The morning of the Royal Wedding, I wasn’t going to serve anything other than scones and tea (or hot chocolate where requested). I made the batter for the scones the evening before, and baked them during the pre-wedding festivities on the 29th. And if they look a little well-baked, I can only blame my eagerness to see Kate’s dress for my missing the oven timer when it went off. I enjoyed every second of the coverage. I sang along with “Guide Me, O Thou Great Jehovah” and I thrilled to the majesty of “Jerusalem”. I held my breath as William struggled to put the ring on Kate’s finger, and I sighed in relief when Prince Philip got through the occasion without a single faux pas. In short, the wedding was perfect. My youngest daughter and I got up at a quarter to 5 and watched it throughout. My husband joined us just in time for the ceremony. My oldest daughter only ventured into the room to eat a scone, but spent the day talking to her friends about Kate’s look (thumbs-up), the Queen’s look (pretty great for an 85-year old) and William’s look (no one had any idea what he wore). 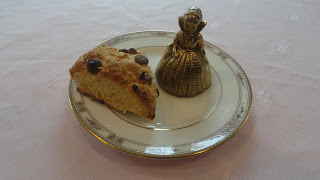 The basic scone recipe that I used is here. For our festive breakfast, I made two flavours, based on the ingredients I had on hand. Half of the batch was fashioned into chocolate orange scones, while the rest were white chocolate and ginger. 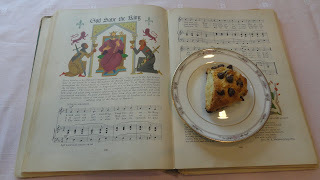 Take a look at the music I’ve posed the scone beside. It’s from a piano book that’s so old (1947), the music was “God Save the King”. Elizabeth didn’t become queen until six years after the book was published. My dad picked up the music book at a yard sale about 35 years ago and it’s become a family staple. I hope these scones become a family staple for you! Make scones as directed here, through to the part where you stir the dough with a fork. Omit the ¾ cup raisins. In half the dough, add ¼ cup chocolate chips and the grated rind of one orange. In the other half of the batter, add ¼ cup white chocolate chips and two tablespoons of finely minced candied ginger. Finish the recipe according to the directions. Sigh. So jealous. Your scones turned out!!! I loved every minute of the wedding too – the music was just wonderful! Ruth. I can't think of a better way to celebrate such an enchanted wedding! These scone sound lovely. Great scones! For me a dollop of Devon cream on my scone will complete the celebration. I hope they live happily ever after! Cheers!!! I watched via reruns…but it was lovely. Your scones are very appropriate for this special day, Beth. We love scones at my house! Oh I love that you have that piano book with that particular piece! Well placed photo. I love scones, too. I watched bits and pieces of it. The dress was beautiful but so simple, I guess I expected more. These scones look so delicious. Your scones ARE fit for a King… or Prince.. or Princess! Both flavors sound wonderful! I loved watching the wedding! It would have been so fun to be able to see the celebrations that took place inside the palace. Very British-tea and scones-yum! Perfect for the wedding. I'm sure you must have had a "cream tea". My friends in Dorset say their Dorset cream teas are the best! Your scones look delicious! I was up at 4am and thoroughly enjoyed all of the pageantry of the Royal wedding. I didn't make scones though. Yours sound delicious! I was just thrilled by Queen Elizabeth's choice of yellow for the wedding. She is just such a thrill to watch with that purse of hers! I enjoyed all the coverage too!! I wasn't totally into the pre-wedding buzz, but when it came down to the actual wedding, I woke up super early to watch it. Missing from my life was a good scone to feel all British-like, but I'm glad your family made it such a special occasion with scones and tea! It sounds like you celebrated the royal wedding in style! I just couldn't bring myself to get up early to watch it, but I definitely caught up on it after the fact. Wish I had had one of your scones for breakfast! Scones are the perfect way to celebrate such happenings. So glad you enjoyed the wedding! I agree that the wedding was absolutely perfect. Kate and Pippa were stunning. The Queen look beautifully elegant. Excellent choice of scone flavors! I might have to play around with the white chocolate/ginger combination. it is nice to find your blog, I like it, please visit mine if you have the chance. p.s im your newest follower! Nice, I like the version with the white chocolate chips and candied ginger! Normally I'd discourage using music as a place mat, but in this case I understand why you did it. Here's to making a classic! I haven't seen the wedding live but I've watched some of it on the news. It was really great 🙂 The scones looks wonderful Beth. You've made it perfect. Wasn't it romantic? And the dress! And the smile! One of the news services had a lip reader on the job, and apparently as she walked up the aisle, Harry leaned into William and said 'Just wait until you see the dress.' Sigh. These scones are gorgeous and definitely quite fitting for the big event! I'm impressed you made them. My baking involves putting those pre-made cookies in the oven. Beautiful scones Beth! I love the book as well! Scones and tea make a really wonderful breakfast! I love scones – these are so perfect for the Royal wedding! Wasn't it delightful! – we had champagne plus some good goodies to eat as we watched the whole wedding, twice (on two different channels). I love how you made scones for the occasion. And I looooove scones. Blueberry, pumpkin, cranberry. Making myself hungry. I live in So Cal, and didn't want to wake at 2 a.m., so I watched the wedding recaps the next morning. Beautiful. Lovely! I confess that I watched the wedding on one of the reruns…but it was still magical to me. Those pictures are inviting. And that book was a great find. Hilarious! Fortunately I'm from London so the wedding was at a very reasonable 10am for me. But scones…now I didn't think of that! It sounds like you had a wonderful time watching the wedding. Chocolate and scones and royals…a perfect combination! What delicious scones! I like the sound of both versions! I would of loved to munch on these while watching the rerun. I did watch the ceremony and it was beautiful. She looked so classy and elegant. I watched every second I could and enjoyed it so very much. your scones look so good and with chocolate; it just has to be excellent. Mmm I love scones. Great with tea :). Yours look great!